Addiction is defined as a chronic, relapsing brain disease that is characterized by compulsive drug seeking and use, despite harmful consequences.† It is considered a brain disease because drugs change the brain—they change its structure and how it works. These brain changes can be long-lasting, and can lead to the harmful behaviors seen in people who abuse drugs. †The term addiction as used in this booklet may be regarded as equivalent to a severe substance use disorder as defined by the Diagnostic and Statistical Manual of Mental Disorders, Fifth Edition (DSM-5, 2013). Addiction is a lot like other diseases, such as heart disease. Both disrupt the normal, healthy functioning of the underlying organ, have serious harmful consequences, and are preventable and treatable, but if left untreated, can last a lifetime. To feel good. Most abused drugs produce intense feelings of pleasure. This initial sensation of euphoria is followed by other effects, which differ with the type of drug used. For example, with stimulants such as cocaine, the “high” is followed by feelings of power, self-confidence, and increased energy. In contrast, the euphoria caused by opiates such as heroin is followed by feelings of relaxation and satisfaction. To feel better. Some people who suffer from social anxiety, stress-related disorders, and depression begin abusing drugs in an attempt to lessen feelings of distress. Stress can play a major role in beginning drug use, continuing drug abuse, or relapse in patients recovering from addiction. To do better. Some people feel pressure to chemically enhance or improve their cognitive or athletic performance, which can play a role in initial experimentation and continued abuse of drugs such as prescription stimulants or anabolic/androgenic steroids. Curiosity and “because others are doing it.” In this respect adolescents are particularly vulnerable because of the strong influence of peer pressure. Teens are more likely than adults to engage in risky or daring behaviors to impress their friends and express their independence from parental and social rules. If taking drugs makes people feel good or better, what’s the problem? When they first use a drug, people may perceive what seem to be positive effects; they also may believe that they can control their use. However, drugs can quickly take over a person’s life. Over time, if drug use continues, other pleasurable activities become less pleasurable, and taking the drug becomes necessary for the user just to feel “normal.” They may then compulsively seek and take drugs even though it causes tremendous problems for themselves and their loved ones. Some people may start to feel the need to take higher or more frequent doses, even in the early stages of their drug use. These are the telltale signs of an addiction. Even relatively moderate drug use poses dangers. Consider how a social drinker can become intoxicated, get behind the wheel of a car, and quickly turn a pleasurable activity into a tragedy that affects many lives. Is continued drug abuse a voluntary behavior? The initial decision to take drugs is typically voluntary. However, with continued use, a person’s ability to exert self-control can become seriously impaired; this impairment in self-control is the hallmark of addiction. 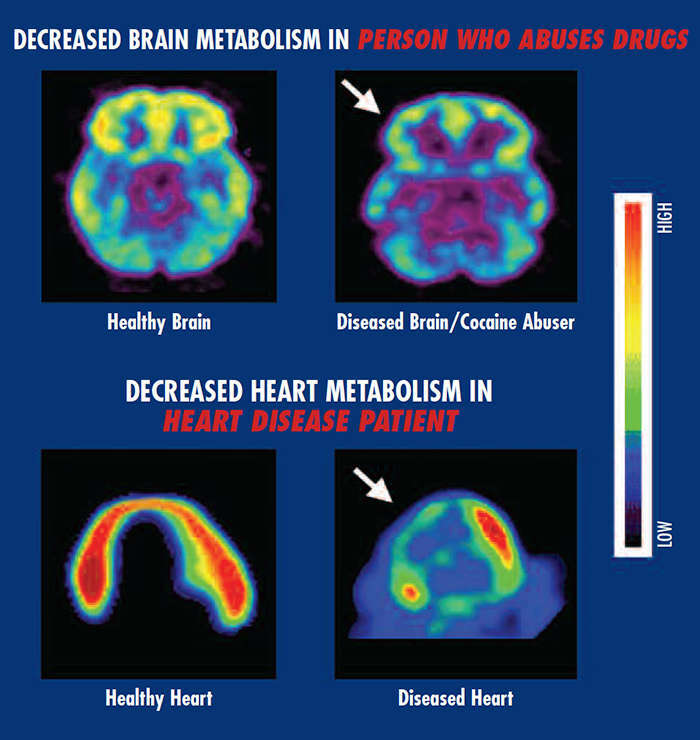 Brain imaging studies of people with addiction show physical changes in areas of the brain that are critical to judgment, decision making, learning and memory, and behavior control.7 Scientists believe that these changes alter the way the brain works and may help explain the compulsive and destructive behaviors of addiction. No single factor determines whether a person will become addicted to drugs. As with any other disease, vulnerability to addiction differs from person to person, and no single factor determines whether a person will become addicted to drugs. In general, the more risk factors a person has, the greater the chance that taking drugs will lead to abuse and addiction. Protective factors, on the other hand, reduce a person’s risk of developing addiction. Risk and protective factors may be either environmental (such as conditions at home, at school, and in the neighborhood) or biological (for instance, a person’s genes, their stage of development, and even their gender or ethnicity). What environmental factors increase the risk of addiction? Home and Family. The influence of the home environment, especially during childhood, is a very important factor. Parents or older family members who abuse alcohol or drugs, or who engage in criminal behavior, can increase children’s risks of developing their own drug problems. Peer and School. Friends and acquaintances can have an increasingly strong influence during adolescence. Drug-using peers can sway even those without risk factors to try drugs for the first time. Academic failure or poor social skills can put a child at further risk for using or becoming addicted to drugs. What biological factors increase risk of addiction? Scientists estimate that genetic factors account for between 40 and 60 percent of a person’s vulnerability to addiction; this includes the effects of environmental factors on the function and expression of a person’s genes. A person’s stage of development and other medical conditions they may have are also factors. Adolescents and people with mental disorders are at greater risk of drug abuse and addiction than the general population. Children’s earliest interactions within the family are crucial to their healthy development and risk for drug abuse. What other factors increase the risk of addiction? Early Use.Although taking drugs at any age can lead to addiction, research shows that the earlier a person begins to use drugs, the more likely he or she is to develop serious problems.8 This may reflect the harmful effect that drugs can have on the developing brain; it also may result from a mix of early social and biological vulnerability factors, including unstable family relationships, exposure to physical or sexual abuse, genetic susceptibility, or mental illness. Still, the fact remains that early use is a strong indicator of problems ahead, including addiction. Method of Administration. Smoking a drug or injecting it into a vein increases its addictive potential.9,10 Both smoked and injected drugs enter the brain within seconds, producing a powerful rush of pleasure. However, this intense “high” can fade within a few minutes, taking the abuser down to lower, more normal levels. Scientists believe this starkly felt contrast drives some people to repeated drug taking in an attempt to recapture the fleeting pleasurable state. Addiction is a developmental disease—it typically begins in childhood or adolescence. The brain continues to develop into adulthood and undergoes dramatic changes during adolescence. One of the brain areas still maturing during adolescence is the prefrontal cortex—the part of the brain that enables us to assess situations, make sound decisions, and keep our emotions and desires under control.11 The fact that this critical part of an adolescent’s brain is still a work in progress puts them at increased risk for making poor decisions (such as trying drugs or continuing to take them). Also, introducing drugs during this period of development may cause brain changes that have profound and long-lasting consequences.